Here’s a sample of some of the kind letters and comments we’ve received from delighted customers! Thank you for singing at our wedding Saturday. Ourselves and our guests thought you were fantastic and reduced many to tears. The singing was so overwhelming. The feedback we received from our guests was very positive and we honestly can’t thank you enough, It’s just a shame we could’nt thank you personally on the day. Please carry on the good work because you bring so much joy and pleasure to people’s experiences. St Oswald’s Church Malpas Wedding of Jess and Keri – 29/8/2015. AMAZING!!! Thank you for a spectacular performance. I couldn’t of wished for a better entrance from yourselves, you truly made it special. Can’t wait for the video to relive it all again. Your singing was Absolutely beautiful ! I was at the back of the church and the sound was tremendous ……. No mean feat in such an enormous church with such a high vaulted ceiling ! It was very emotional and apart from the singing you could have heard a pin drop such was everyone’s complete focus on the choir . Fabulous Choir Thankyou a privilege to be there and to hear you. Thank you for your email – and what a lovely blog – what can I say – words cannot describe the beautiful singing and the atmosphere of a little church in the Welsh hills – it was magic. We hope all is well with you and the choir? We hope your ears are all burning as you are the talk of Washingborough! Not least with us – wow! You were all fantastic! Goosebumps abound. We can’t describe the impact you had on our day. What a brilliant concert last night in St John’s Church Washingborough. A fantastic sound. Thank you one and all. Some members of The City of Lincoln Male Voice Choir attended your concert in Washingborough church near Lincoln. We really enjoyed your programme and singing mixed with good humour and entertainment. Choirs can always learn from other choirs as we did watching/listening to you guys. We hope you enjoyed your short visit to our City and a safe journey home to the Land of Song!! As we look forward to welcoming the famous Welsh Morriston Orpheus Male Voice Choir to Lincoln in 2016 if plans go well!! Best wishes to you all. Keith Hebblewhite.Thank You all for a brilliant concert, and singing Gwahoddiad, one of my favourites. Nigel ThomasWonderful to hear you on Sat evening at St Johns Church and a most unexpected encore in the Ferry Boat afterwards. Listened to the CD yesterday. Great to find out that some of you knew one of our bridesmaids who had done nurse training with my wife Carolyn. January 1, 2015 Thank you to all for singing so beautifully at my Daughter Claire’s wedding to the Lovely John ! As I walked into the church I was filled with such emotion it was stunning ! Claire and John are such a lovely couple and everyone who knows them say they are besotted with each other and have such a relaxed approach to life that I think shone out in the beautiful service . John filled with emotion and then Claire and John smiled and laughed through the whole day from waking in the morning they both enjoyed their special day . We would like to send our sincere thanks to the choir for helping to make the wedding of our daughter Rhian to James such a memorable occasion, The singing was really beautiful and very much appreciated by all of the guests young and old. Thank you very much, you made our special day even more special. Having the choir performing and joining in with the hymns made it a very moving and special wedding blessing service for us. All our guests commented on how wonderful the choir sounded. We never imagined how overwhelming we would feel hearing the choir sing at our wedding and in such a beautiful church too. It truly was a very special and very memorable day thanks to the choir! I just wanted to say what an amazing addition to the wedding day the Choir were, you were absolutley fantastic. 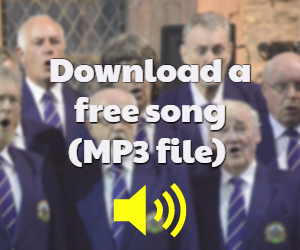 I love the video and have watched it many times already – and when thinking back on my big brother and new sister-in-laws beautiful wedding day – it’s certaintly sound-tracked by the incredible sounds of the Denbigh Male Voice Choir; so moving, emotional and talented. Many thanks, Emma Lewis. August 9 2014. So many guests said afterwards how wonderful and moving your music was… it certainly added to our ceremony that really special something, that one can’t express in words… and Vicki, from the castle, said that it was the best wedding they’ve ever had! I loved every song, and I certainly know that the ceremony would not have been the same without you. And David – your solo was amazing! It meant so much to me and my family. Please pass our thanks on to every member of the choir – we could not have been luckier than to have you singing for us! Again, I can’t believe that we didn’t get the chance to thank you ourselves on the day. And we missed out on the photo with you all! All our best regards, and thank you again for making the happiest day in our life so special. Thank you so much for the excellent singing at our wedding on the 22nd of May. So many guests commented on how wonderful and moving the singing was. Diolch yn fawr. Thank you so much for singing at our wedding on the 19th March. The singing was beautiful and we had many compliments from our guests. It really helped to make the day even more special. Many thanks. A lovely ceremony and out into the summer sunshine and a short drive to the fabulous Bryn Kinalt Hall and Paul and Claire’s terrific marquee. 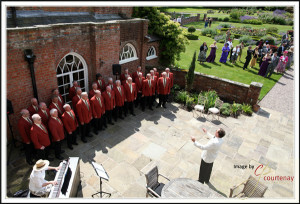 What a welcome in the gardens awaited us, the fab Denbigh Male Voice Choir, a real treat to be serenaded by such fine voices whilst drinks and canapés served. William and I thank the Choir for making our wedding day, 13th August 2011, that extra bit special. Everyone from far and wide were thrilled with your singing. Thank you once again, you were wonderful. Many thanks to you, and the entire choir for the contribution towards our ceremony and our celebrations. (18th August 2012) We are delighted with the words shared on your web site. Your performance touched and educated many of our guests. It’s our pleasure to thank you and the choir for making our day complete. Unfortunately we can’t take credit for the weather. So many of our guests commented that your performance was one of the highlights of the day. Many had never heard a Welsh male voice choir and were amazed. I can’t tell you how much pleasure it gave us personally to have you all there, aware of the long travel that it took to get to Nant. Please also thank your pianist for her wonderful support (playing ‘I’m getting married in the morning’ before Sheelagh arrived was a touch of brilliance!) and everyone for performing in such cramped surroundings. I just wish the schedule had allowed for us to hear more of you. As a small token of our thanks I’ve put an extra £100 into the choir account. Please buy everyone a drink on us the next time you get the chance. With the greatest of thanks, Alun and Sheelagh Crewe.